‘Tonight’ is the understated introduction to ‘Saw You Dancing,’ the debut collection from Glasgow’s Hermit Crabs. Though barely over two minutes in length, it aptly showcases what is to be expected throughout the album; acoustic and electric guitars drive the song before a flourish of violin in the second half, and lead vocalist and chief songwriter Melanie Whittle maintains a sober tone as she picks at the bones of a failing relationship (a recurring theme across the album’s ten tracks). Indeed, it would be fair to say that this is not a ‘happy’ album, despite the presence of Burnsong competition winner ‘Feel Good Factor’ which extols the virtues of Glasgow’s bustling and well- renowned Sauchiehall Street. The majority of the music is delivered with a distinctly mournful air, and even when the pace picks up such as on ‘Goodbye My Friend,’ the song remains at heart a wry lament. ‘Third Time Lucky’ expresses regret, the pining for absent friends, and with its sweetly melodic guitar and harmony parts shows how well the Hermit Crabs can musically articulate sadness. Though sonically they stay downbeat throughout the album, rare hints that the band have more than sorrow up their sleeves, perhaps include the introductory handclaps on ‘Lean Free Summer’ and the flashes of humour in Whittle’s lyrics. 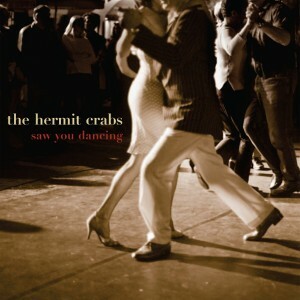 With the Hermit Crabs’ indie sound embellished by violin and occasional dabbles into additional instrumentation, and the tinges of folk which permeate the record, it is perhaps too easy to bring the likes of Belle & Sebastien and Camera Obscura to mind, and yet all the same impossible to avoid either comparison. Fans of both bands will appreciate this solid debut which should provide the band with a sure footing on which to build. --Is This Music?